Twitter announced today that polls will be finding their way to the feed in the coming days. Polls will give everyone the opportunity to get public opinion on any question they want answered and it’ll help users voices be heard. This exciting new feature will bring a new dimension of interaction to the social platform and give everyone the opportunity to ask and answer any question they’d like. It also offers great new opportunities for marketers and their audiences. Here’s what you need to know to make the most of it. Polls on Twitter bring all kinds of great options for marketers. We’ve worked so hard over the years to increase engagement with our audience and this new addition adds an easy way to get our audience to interact. Questions have always been one of the best ways to get your followers to engage. A question gives the reader the opportunity to respond and helps to create a two-way conversation. The previous challenge was getting people engaged enough that they take the time to hit reply and type a response. 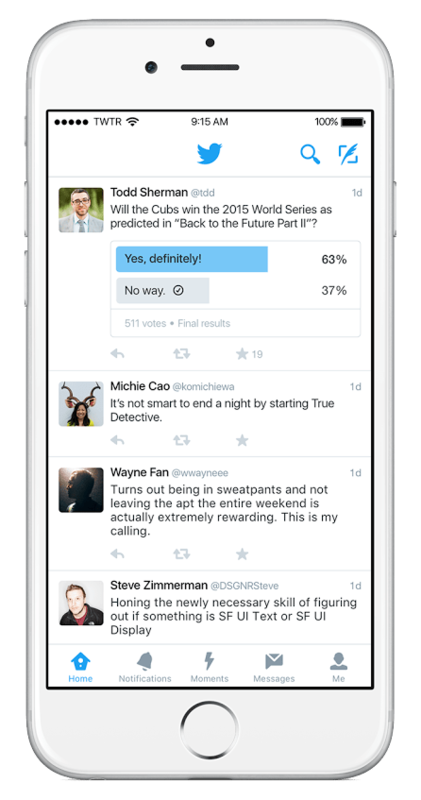 With the new Twitter polls, users can engage and answer with the simple click of a button. This new way of answering has made it easier than ever to respond and should help to raise the response rates for those looking for answers. With this new feature in mind, it’s time to consider how we can use polls and some of the drawbacks we should be aware of also. New Twitter polls are sure to help brands engage with their audiences in a great new way. They make it easy to ask and get insight from your followers. So how can these polls be best used by marketers? There are no limits to the questions you can ask of your audience. Get their opinions on current topics. Find out what they do and don’t like about current offerings. Learn more about what they’d like to see from your brand in the future. Gauge the reception of offerings or efforts. Find pain-points in current products and a million other possibilities. The ways you can use polls to benefit your brand are almost limitless. This new function is a great potions to add to your cache of social media marketing tactics and should be considered in your strategy going forward. While the new polls will make it easier to get responses to questions from your audience, they do have a couple drawbacks that marketers need to be aware of. Twitter polls are limited to 2 options. While they aren’t limited to only ‘yes’ or ‘no’ responses, the polls don’t currently support more than 2 choices. For the time being, the responses options you offer are limited to a one or the other decision from your respondents. Polls are also limited to just 24 hours. After that, the polls will close and viewers will only be able to see the results, but can’t respond themselves. This time limit means you’ll need to be sure you’re posting polls during the right times to get the greatest response from your audience in the allotted time. In that way, Twitter polls are very much in the moment and a snapshot of public opinion. Though, with this time limit in mind, you could do things such as test the response from a weekend audience vs. a weekday one or evening vs. daytime. The new polls make it easier than ever for people to respond to your questions on Twitter. But by making it so simple for people to answer, they’re also made it very simple for people to do so without much thought. Previously, you had to be fairly committed to take the time to click reply and draft a response. Now, it takes just a single click or tap. This is a much lighter engagement than before, which should be weighed as such. Where the previous reply indicated a high level of engagement, the task of responding to polls is just a click. A light engagement, like a favorite. Be sure to measure it as such. While polls show the results of the response, they don’t show who responded. This means you can’t be certain that the question was answered by anyone in particular. Was it really your target audience or was it a spammer? Was it 1 person with dozens of accounts? Possibly people that have no relation to the question? You can’t really say. Where other engagements do allow us to see who engaged (such as favorites or retweets), polls don’t give us that insight. This lack of ability to identify the respondents means the credibility of the results are questionable. Keep this in mind when referencing the results of your polls. They’re great for engaging your audience or gaining more insight from your customers, just don’t believe they’re as accurate as a Nielsen poll or a substitute for your normal customer research. When polls hit the news feeds, you can bet that both brands and every other user are going to be quick to try them out. We’ll quickly see our news feeds filled will polls for every topic under the sun. With this influx in polls, we’re likely to see some get sick of them pretty quick. It’ll be hard to have your question seen in the feed from all the others. With this in mind, you may want to consider when and how you employ polls. It may pay to wait a bit so your questions stand out, rather than getting lost in the mix. You may also want to limit how often you utilize polls, to keep from burning your audience out on them and hurting response rates. The addition of polls within Twitter will give marketers a great new way to get input, interact, and learn more about those who follow them. We’ll gain new insight and a new means of interacting and creating a more engaged audience. While we wait for the polls to hit the feed in the coming days, begin to think about how you can best utilize them to engage your audience and be aware of the limitations too. Consider your social strategy and where polls may fit and benefit. They should become a great new way to boost your response to social questions and social success.